George A. Romero’s fans are like the walking dead he’s made famous in more than 40 years of filmmaking – namely, they are relentless, move in mobs and often covered in bloody latex. That’s the joy – and challenge – of interviewing the director of 1968’s horror classic, Night of the Living Dead . It may take a few attempts to pin Romero down for an interview, but along the way one witnesses the idolatry shed upon the so-called “Grandfather of Zombie Films.” One such attempt was at the May premiere of his sixth zombie film, Survival of the Dead – available Aug. 24 on DVD and Blu-ray - at New York City’s Village East Cinemas where he was swarmed by a crowd of rotting, zombified versions of Lady Gaga, Marilyn Monroe, Tippi Hedren, a Waffle House server, hipster and even a Chihuahua. Romero is being appreciated by a new generation of fans due to a zombie-genre resurrection to rival vampires, and he eats it all up. “How can you get tired of this, man?” he asks. At 6’ 5”, he’s is an imposing character but a jovial one constantly joking and releasing a cackling laugh. A 70-year-old man with a silver ponytail who continues to wear his trademark utility vest and impossibly thick, black-rimmed classes, he poses with decaying devotees and gives a zombie growl to the press photographers. Such a bright disposition may be surprising from the director of Night, one of the best horror films of all time, along with beloved zombie films Dawn of the Dead (1978), Day of the Dead (1985), Land of the Dead (2005), Diary of the Dead (2007), as well as non-zom cult favorites Martin (1977), “Creepshow” (1982), Monkey Shines (1988), The Dark Half (1993) and several others. Yet during a conversation a few days after the New York premiere, Romero says he wants audiences to have fun with his work, despite whatever underlying messages his films have. “Even though I’m trying to say something about the state of humanity, the state of mankind, it’s also meant to be funny in large parts,” says Romero who likens his zombie films to EC Comics horror titles in the ’40s and ’50s, such as Tales from the Crypt . The “giggle while you barf” moments from those comics inspired him to include “looney tunes moments” in his movies. and memorable zombie kills, Romero admits to inserting slapstick humor in his tale “about war and enmities that don’t die.” But he also says he wanted to play with the notion of a quasi-Western genre with Survival. While he may run amok with his creative control, Romero says he always keeps a firm grip on the focus of his films, which are the people. That’s why - aside from Night, which he calls a little bit creepy – he doesn’t think his “morality tales” are scary. Plus, he adds, he’s not even particularly fascinated by the zombies that defined much of his career. “To me, in those days, zombies were the boys in the Caribbean doing the wetwork for [Bela] Lugosi” in 1932’s White Zombie ,” where they were mindless humans, cursed by voodoo magic. “I didn’t even call them zombies in the first film; I called them flesh eaters. I just wanted some sort of game changing event that my human characters could ignore in favor of petty bickering,” he laughs. Even if he didn’t call them zombies until Romero altered the archetype of the zombie by creating a hybrid of the classic voodoo-afflicted drone with vampiric ghouls. What he didn’t do, was try to make them symbolize social problems. Over the years, a lot of meaning has been associated with Romero’s choice of zombies as an allegory for a dozen other things – but not because of his doing. 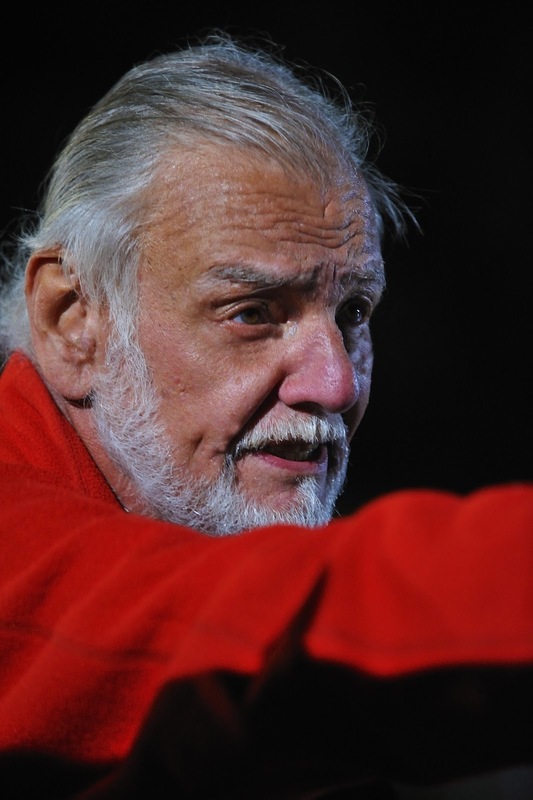 Romero knows all the suggestions that “Zombies represent the dullness of humanity, how we’ve become immune and dull, and we’re walking around dead, doing what we’re expected to do.” But he says he doesn’t think that way. Although he’s good natured about it, Romero is a disappointed optimist who thinks most of North America needs an anger management session. “To me, they’re just the disaster,” he says, which could even be a hurricane, but that people still wouldn’t be handling it well and would opt instead to shoot each other instead of address game-changing events. In his world, Romero says the villains are the humans and the zombies are intentionally predictable; they can easily be dealt with or escaped if you don’t screw up. This outlook in Romero’s work gets to the heart of why he has always been, and will always be in, the slow-moving, shambling zombie camp. 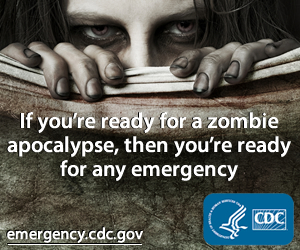 Romero never intended there to be a reason behind his zombie uprising. In Night, he filmed three possibilities to keep it ambiguous. Because of the need to trim run time, the one that made the final cut was a returning Venus Probe since it involved a lot of production value in his Washington, D.C. scene – it was the only time his crew left Pittsburgh to shoot elsewhere. The reason for zombies notwithstanding, the current zombie renaissance is still going strong with video games such as Left 4 Dead , Robert Kirkman’s lauded comic book series The Walking Dead or the horror-comedy Zombieland ,” and is partially attributable to the 2004 Zack Snyder remake of Romero’s celebrated 1978 “zombies in a mall” movie, Dawn of the Dead . Romero is diplomatic about Snyder’s version, but says he’s “not particularly” happy about the remakes of his film. He calls the first 20 minutes of the movie “hot” before it loses its purpose, and adds it felt more like a video game than a movie. He feels the same about the 2010 remake of his 1973 not-quite-zombies protest movie, The Crazies , which he says felt like it was trying to be 28 Days Later. 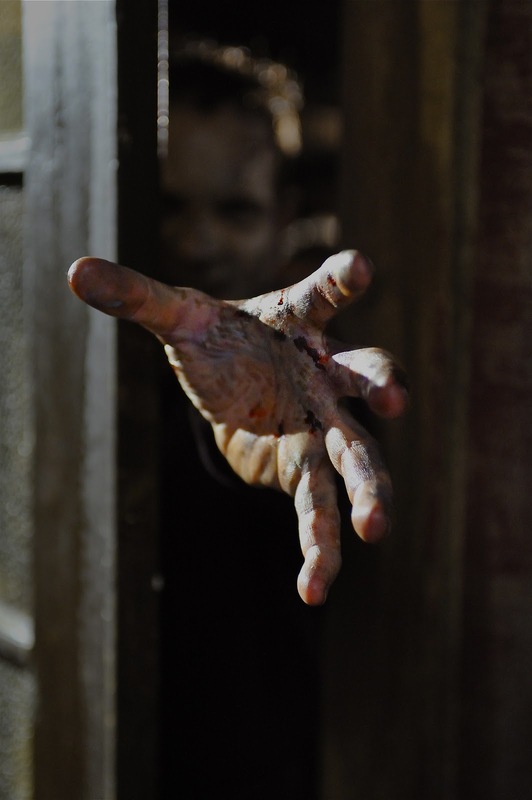 Still, although remakes haven’t always been kind to Romero’s source material (the 2006 film, Night of the Living Dead 3D , for instance), he has benefitted from the modern zombie popularity. Land was a successful pre- and post-9/11 commentary from Romero, and the New Media-inspired Diary was a low-budget, profitable outing that allowed him to reboot his zombies in a franchise – all the while maintaining more substantial ownership rights. Compared to “Night,” which is part of the public domain, Survival is Romero’s first direct sequel and it marks the only time he’s been able to use recurring characters. It looks as if he’ll be able to return to that franchise with those characters for two more “… of the dead” pictures, which is a kind of job security he says he’s not used to. He’s also connected to the iTunes App of the Dead that allows iPhone and iPad users to affix zombie graphics to pictures of loved ones – and then to shoot them – based on makeup from Romero collaborators Tom Savini and Greg Nicotero. 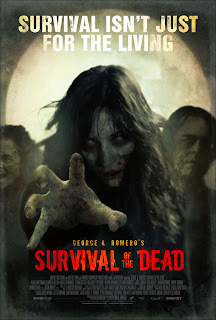 But Romero says you won’t see him promoting zombie survival kits, or the theory that a real zom-pocalypse is on its way unlike his friend, Max Brooks, the author of The Zombie Survival Guide and World War Z .
Romero concedes he’s baffled and amused by the trend, however. Perhaps surprisingly for a filmmaker whose movies typically include some supernatural theme, Romero says he doesn’t really believe in anything paranormal. This is the voice of the practical filmmaker Romero, who deals with the dictates of reality. He says he has ideas for non-zombie movies, but has learned from experience he doesn’t have the energy to wind up in Hollywood for years at a time, “in development hell,” trying to get financing for projects that never happen – especially if he can instead get backing for more zombie flicks, which he enjoys doing. But for anyone who hasn’t seen a Romero flick, he’d rather you begin with Knightriders or Martin, his 1977 vampire deconstruction about a “mixed-up kid” that he started as a spoof then began to take seriously. With regards to his zombie movies, Romero recommends starting the viewing of his zombie oeuvre with Diary – and doesn’t suggest Night first except to see where he got his start. He admits he wasn’t thinking about mythology or the development of zombies with Night. After all, he points out, the ghouls in that movie were eating insects in addition to humans. Plus, after the acclaim he garnered with his freshman effort, he says he was reluctant to return to the devouring dead. Still, mistakes and all, Romero says breaking into moviemaking was easier for him compared to younger filmmakers, even though it’s technically easier to shoot a film today. He balks at the idea that there are no new ideas “out there,” and instead blames the movie distribution system. Even in terms of his own success, Romero is pragmatic about the chances of having a hit on his hands. Romero says he has “big hopes” for new projects from Halloween helmer John Carpenter and his good friend Dario Argento, the Suspiria director he credits with making Dawn happen because he was the first to bring money into the production. But any time he gets the chance, Romero also mentions a younger filmmaker of Hellboy and Blade II fame.